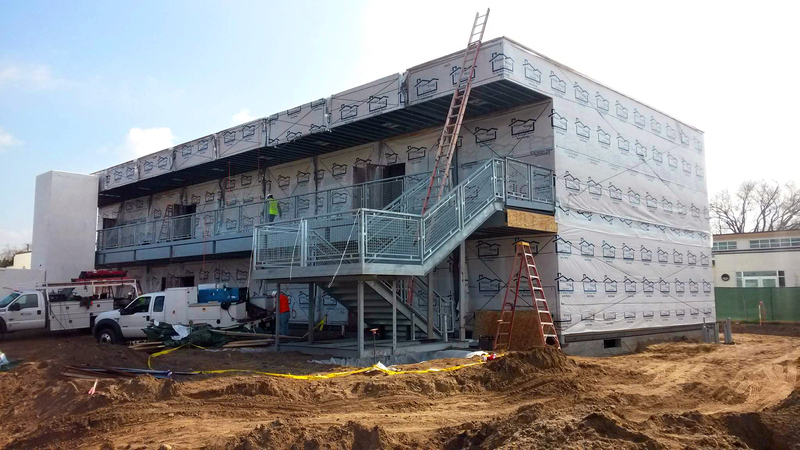 March 4, 2015 — The first of two 2-story classroom buildings funded through Measure E on the Walnut Street campus of Newhall Elementary School is being erected. The second building is expected to arrive during spring break 2015. Each of the new buildings will house 8 classrooms and will replace all portable classrooms on the campus. The buildings will be connected by a bridge walkway and elevator. The energy-efficient buildings will use solar tubes for lighting on the upper story. The buildings include new staff and student restrooms, and all classrooms will have built-in storage, SMART boards and wireless capability. Funded through the voter-approved Measure E facilities bond of 2011, the new classrooms are expected to be completed in time for the opening of the next school year in August 2015.